This has seriously got to be the most ridiculous thing on the face of this planet. 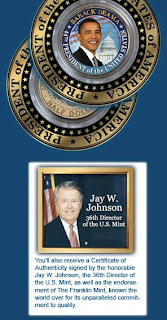 I was up at 1:30 this morning and happened to have the tv turned to a commercial in the office...already, they are selling presidential coins of the 'bama. and for 19.95 (plus tax) you can wow your friends with what will later be a piece of junk commemorating the WORST. PRESIDENT. EVAH! Get one before The New York Times spends all of their bailout buying all of them! 'nother Ed Note: And will everyone please be sure NOT to tell Bean about QVC selling all THIS OBAMESSIAH JUNK? *spoken in my best butthead voice* "you said, douchesicle.. heh heh heh"
Well, kinda but it does look better than that Dale Earnhardt one.